Within the last couple of years, there has been a rising trend of using activated charcoal as a “do-it-yourself” technique to whiten teeth in the comfort of your own home for a very affordable cost. As the majority of consumers, myself included, sought for quick ways to whiten and brighten our teeth without hurting our budget, we couldn’t help but notice that this specific product has been recognized as one of the top search results for teeth whitening on major search engines. But, at what cost will it take for us to stop and consider if such techniques would be more harmful than beneficial to our overall oral health? 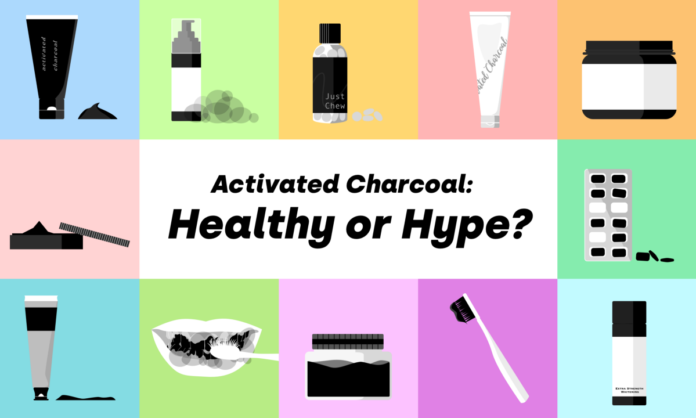 And what exactly is activated charcoal? When we hear people talking about activated charcoal for teeth whitening, they aren’t exactly talking about the black chunks we use for grilling or the remains of burnt woods. Though this product has been found to have some similar properties as barbecue charcoal, it’s not quite the same thing. Rather, activated charcoal is a black powder created from coconut shells, olive pits, coal, and several other natural materials. These ingredients are then mixed together and treated with steam, oxygen, carbon dioxide, certain acids and other chemicals in order to activate it. This process creates the changes to its internal structure, allowing the final product to be more porous than regular charcoals. As we dig furthermore into our findings, we were surprised to find that activated charcoal has been around and used for quite some time in various situations. In 1831, a scientific investigator named Tovery demonstrated the benefits of this substance by standing before the French Academy of Medicine and ingested a lethal dose of strychnine mixed with charcoal. It was resulted that Tovery suffered no ill effects from the strychnine because of the simultaneous ingestion of charcoal. In 1834, it was used medically for the first time by an American doctor to save the life of a patient who ingested mercury chloride on accident, and gained its popularity in the 20th century as a teeth whitening product. Activated charcoals have negative electrical charges, which attract positively charged molecules like toxins and gases; the charcoals absorb and trap the unwanted molecules. Additionally, it has similar effects when used to fight the nasty free radicals that occur in our body. Because activated charcoal cannot be absorbed by the human body, it carries the unwanted toxins out of the body through excretions. Although activated charcoal has been around for some time, it is important for us to keep in mind that this product has only been more widely accepted as an essential tool for poison management within the last 20 years. In addition to activated charcoals being an essential tool for poison management, it has many healing properties and beneficial medicinal uses. When used in a controlled environment and on a case-by-case basis, activated charcoal may improve kidney function and reduce drug absorption by up to 74 percent in adults; it has been shown to reduce the over-the-counter and prescription drug effectiveness when taken after the drugs were ingested. Those who are currently suffering from a kidney disease — a disease where the kidneys can no longer properly filter waste products, may benefit from using activated charcoal due to its toxin-binding qualities which help to reduce the amount of waste products that the kidneys have to filter. Additionally, a study conducted with patients who struggled with high cholesterol showed improvements in lowering the percentage by at least 25 percent when they took activated charcoal every day for four weeks. When considering implementing activated charcoal for medical uses, we are confident to say that it will have positive effects when consumed under supervision. So.. IS ACTIVATED CHARCOAL OK TO USE FOR TEETH WHITENING? Within the last decade, teeth whitening has become the trendy ‘hot topic’ and a global industry. With dentists providing bleaching treatments at ridiculously high prices to DIY home remedies, how can we know what is good and what should be avoided at all cost in order to obtain that perfect, pearly white smile? And does using products like activated charcoal as a DIY-at-home method really considered to a safe way to whiten teeth? Unfortunately, there’s no formal evidence that activated charcoal does whiten teeth. Even though activated charcoal has been FDA approved for many different health uses, the ADA (American Dental Association) has not approved any types of activated charcoal products for dentistry. Yet, there are plenty of anecdotal evidence showing that they work; consumers who brush their teeth with activated charcoal notice a difference before and after (and have pictures to prove it). If we really think about it, this makes perfect sense: the chemical properties of this charcoal doesn’t neutralize the toxins (in this case, the plaque) — it binds to them and pulls plaque from your teeth. Ultimately, less plaque means less stains, which means whiter teeth. Yet, the million dollar question still stands: is it SAFE to use? After thorough analysis and examination of different research articles, we can conclude using activated charcoal for teeth whitening as this: depending on the product’s level of abrasiveness, some activated charcoal products can be too abrasive to use on your teeth. Abrasion of the tooth occurs when the enamel, dentin, and cementum become weak and wear away over time due to an abnormal process. If you are using activated charcoal whitening toothpaste, then you can check the Relative Dentin Abrasivity (RDA) level of it via search engines — this specific website has a chart listed with more thorough explanation about RDA. If you are unable to find its RDA level, then it might be better not to take the chance and risk it. If the toothpaste seems overly gritty, then chances are, it might be too abrasive to use on your teeth. Since the tooth enamel does not regrow or heal itself, there are legitimate concerns when it comes to using products with activated charcoal. Mainly, these products could potentially rub off or wear down the enamel, which may be detrimental. However, if you are using the activated charcoal powder, then it is recommended to smear it on your teeth rather than brushing it and doing this only 2–3x per week max. Applying this method will reduce the risk of the product causing too much damage to the enamel while still allowing the teeth to be whitened. All in all, we would say that activated charcoal has healthy medicinal benefits, but consumers should take precaution when using it on their teeth. As always, we highly recommend you to consult with your dental professional before attempting to have any type of DIY teeth whitening procedures done at home, especially those that claim to be ‘natural’. If you are unsure about the activated charcoal products you currently have at home that are meant for teeth whitening, then it is best to consult your dentist before using them again! Garden Design : How About This Self-Sufficient Garden Pool Farm? DIY Crafts : Owl stone paperweight.